When setting up a safe perimeter in remote areas is challenging, our Transportable Jammer line of Bomb Jammer technologies is called to action. RF Jamming in order to implement a safe haven sometimes requires a portable option for RCIED defeat. While some portable systems focus on communication jamming, our Radio Jammer technology goes beyond mere communication mediums. Using a unique form of barrage jamming, our Transportable RF Jammer technologies are able to launch electronic warfare attacks on the full spectrum of radio bands that might be used to detonate a remote controlled IED. Our DDS Jammer technology boasts our Direct Digital Synthesis to increase the efficiency of jamming signals. 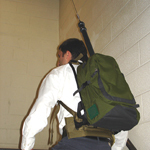 Our Backpack Jammer used by force protection and security agencies demonstrates our radio jamming capabilities in a man-portable configuration. 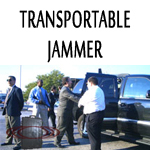 Yet many users of our technologies wish to complement their perimeter of safety with our Transportable Jammers. It is not uncommon for those who already deploy IED Jammer and RCIED Jammer hardware to include a Portable RF Jammer into their convoy RF Jamming setup, because the need may arise to conduct RF Jamming beyond the protective distances of vehicle jamming systems. 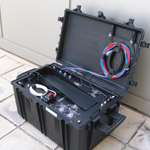 The RF Jammer is a transportable Bomb Jammer wheeled to an outdoor location to quickly start RF Jamming for RCIED defeat or for communication jamming. The Radio Jammer model VIP300U/O uses supplementary modules to conduct barrage jamming, and is the next step up from the transportable RF Jammer, the VIP300U. The DDS Jammer uses Direct Digital Synthesis as a basis for jamming signals and our DDS Jammers are transportable for protection on the move. 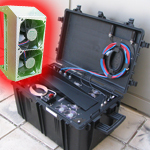 The Backpack Jammer is used for radio jamming, works like an IED Jammer, yet deploys in urban and rural areas where an RCIED Jammer may not be accessible. 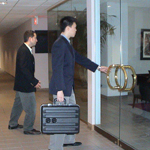 The Portable RF Jammer is built into a briefcase, can be used to enhance normal convoy RF jamming, and performs as good if not better then other RF Jammers.